Anyone trying to find additional ways to donate? Anyone interested in different ways to serve and assist Fuller Center for Housing Macon? If a committee sounds like your specialty, please let us know...contact us at (478) 845-8087 or lbrown@fullercenterorg. This group needs people who are skilled in both leadership and the technical aspects of building. It is also important that members can make good assessments of projects to decide if the project is viable. Material costs need to be be calculated as well as making sure that the applicant does not end up with high service bills. Qualified members could lead training days in specific skills and decide how many volunteers will be needed to accomplish projects. This committee should have members outside of the Fuller Center on it, and would need to help prepare a budget, review bookkeeping, mortgages, insurance, and delinquency policies. A full financial report is necessary to be presented by the committee to the complete board monthly. Appointees for this part of FCHM need to have expertise in social media and coming up with strategies used to promote the organization's mission and causes. Specific strategies may also target potential volunteer workers and donors to give their money, time and skills on behalf of the organization. This group takes over after a client is approved. Members keep up with the applicant through counseling, communication of expectations, and anything else that would continue in the support of them. A mentor from this committee should be assigned on a rotating basis for each family. There have been some major changes over at the Beech house in the last month! Thanks to groups from St. Peter's, James Madison University, Wittenberg University, Northway Church, Wesleyan College, and more, this house is starting to look like a home! Closets have been built, walls and cabinets constructed for the kitchen, most painting completed, yard waste removed, flowers planted, and the porch cleaned and stained! 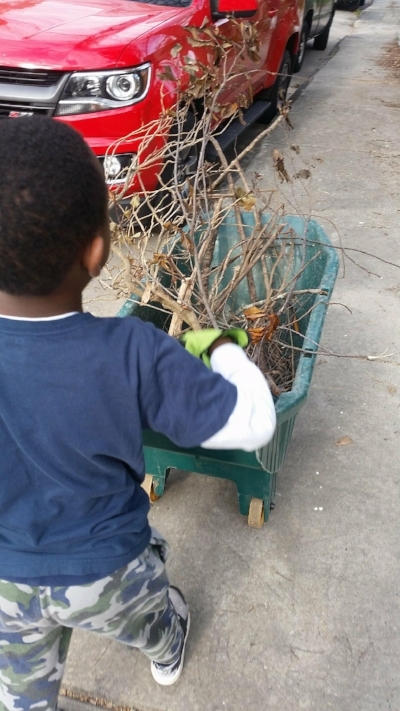 Pictured above, the homeowner's five-year-old son, Tyson, worked hard cleaning up the yard. He, along with his siblings, are so excited about their house that they turned down the opportunity to go to the movies so they could work on their house! It's been great to see how much of a group effort this transformation has been and the sheer number of lives touched to make this Save-a-House/Make-a-Home come to fruition. We love working alongside the Howard family and know they are looking forward to moving in this summer! A great big thank you to Mary Pinson for an amazing floral workshop last month for the Fuller Center! The arrangements are beautiful and unique. There were thirteen participants, a perfect size to fill Mary's beautiful studio. Not only were the take-home arrangements beautiful, but we also raised $1,336 to support FCHM. Pictured above (left to right) is workshop participant Amy Alderman, organizing board member Betty Ragland, host Mary Pinson, and participant Dawn Newsome. Thank you to Renasant Bank for sponsoring this event. Read more from the April newsletter here. Grant Approved for Neighborhood Association! Two residents of Napier Heights, Stephanie Miller and Sara Nourachi, have been approved for a neighborhood grant through the Historic Macon Foundation! The grant funds will be used for a large-scale clean-up effort (see below), banners to put on the light poles similar to those of Beall's Hill and Historic Vineville, as well as to put together a website where the Napier Heights community can get information and connect. This is great news for the neighborhood, and we're excited to see where it goes! Stay tuned for more information and to get involved. As part of the grant Sara and Stephanie received, there will be a neighborhood wide clean-up in just a few weeks! The event will be hosted in conjunction with other organizations including Keep Macon Bibb Beautfiul and the Macon city government's Solid Waste Department. We are hoping to have as many neighbors participate as possible, so please spread the word about April 14th! We will have more information regarding times, target locations, and where to drop off yard waste/trash soon. Plan to meet at 2140 Montpelier Avenue at 8am to pick up supplies. Are you signed up for this year's Legacy Build and Conference? We are! The Build will take place in Americus, GA and is scheduled for Sunday, April 15 -Thursday, April 18. After the Legacy Build wraps up, stay in town for the Annual Covenant Partners Meeting Friday, April 19 - Saturday, April 20, hosted by First United Methodist Church in Americus! For more information on how you can register to be a part of the Legacy Buildand/or Conference, follow the links. We hope to see you there! Our next work day is: Saturday, April 14, 2017. We will meet at 2140 Montpelier Avenue for supplies and information before transitioning to work throughout the Napier Heights neighborhood for the clean-up event. Can you help us reach our goal of five new monthly donors by the end of April? Our monthly donors are the heart and soul of our organization. Their generous support and kindness is what allows us to help families live safe, healthy, full lives. Join this group today! Need an Activity for a Church, Club, or School Group? FCHM would love to partner with any group to host a supply drive that will help us keep our operating costs at a minimum. In April we're collecting safety supplies. We use dust masks, plastic gloves, work gloves, safety glasses/goggles, old clothes or towels, and trash bags when our volunteers are at the work sites. Thank you for adopting The Fuller Center Macon and helping us to keep our costs low and our volunteers safe. Our next work day is Saturday, March 24, 2018. Meet at 2069 Beech Avenue, 9am to 12pm. We featured Ms. Taylor and her family of four (ages 8, 7, 3, and 4 months) back in November in "Meet Our Families." Ms. Taylor is a single mother who lives with the chronic illness Crohn's Disease. Through FCHM's Greater Blessings Program, Ms. Taylor was able to have a minor roof repair completed. Now, Ms. Taylor and her kids can live without buckets lining the house to catch rain coming in. Unfortunately, we are still trying to raise the money to fix the electrical wiring in the house. As the house is now, the electrical system poses an extreme danger and risk for fire. The cost for electrical rewiring of this home is $3,800. We have a pledge of $1,000 and need to raise $2,800 more before we can install new wiring and finally help Ms. Taylor's children feel safe and secure in their home. Will you make a donation for this Greater Blessing? The FCHM appreciates all the groups who help us keep our cost at a minimum by donating monthly materials and supplies used regularly. Products we're collecting in March are safety supplies. We use dust masks, plastic gloves, work gloves, safety glasses/goggles, old clothes or towels, and trash bags when our volunteers are at the work sites. Thank you for adopting The Fuller Center Macon and helping us to keep our costs low and our volunteers safe! Read more from the March newsletter here. There are still tickets left for this fun event THIS Saturday, March 10! Don't miss out. Spring Break is here, March 3-10! This year FCHM will host two groups from James Madison University from Harrisonburg, VA and Wittenberg University from Springfield, OH. We love working with college groups during this "alternative" spring break! 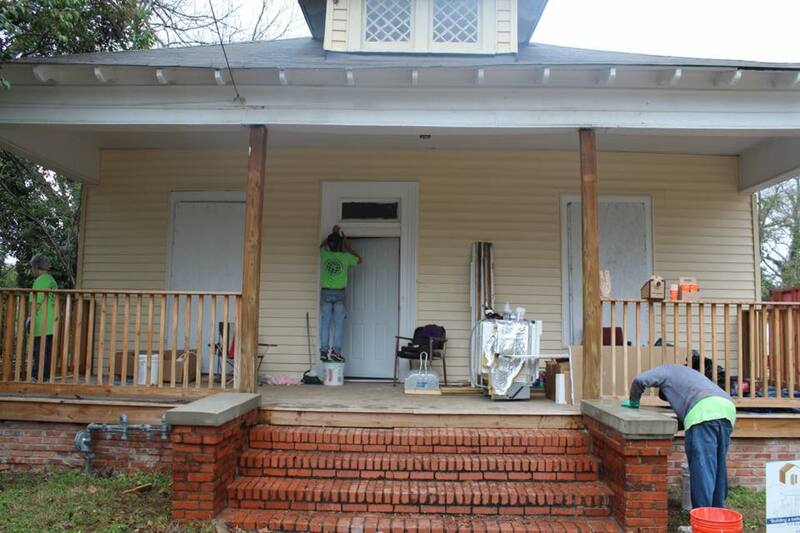 The Fuller Center for Housing Macon is working to revitalize the Napier Heights neighborhood. Check out what's going on! What a great turnout for the first Napier Heights Neighborhood Association meeting on Saturday, February 10! We had around fifteen community members come together to share their ideas, prioritize issues, and brainstorm for a better tomorrow. Mark your calendars now for the next meeting on Saturday, March 10 at 2pm at 2140 Montpelier Avenue! Napier Heights also had its first neighborhood watch meeting in February. This group, a subsidiary of the more general neighborhood association, is learning how to recognize, respond to, and prevent crime on their streets. Join us for the next meeting on Saturday, March 10, after the neighborhood association meeting. We had a great week with this outstanding group of volunteers from Illinois! Starting with a potluck on Sunday, they worked hard all week to turn a derelict house in Napier Heights into a loving home. Check out this feature on WMAZ about their work! Thanks, St. Peter’s, for your hard work and great attitudes! During the week of February 12, FCHM had the opportunity to attend Macon's Revolving Fund Summit. For the Summit, community leaders from all over the nation traveled to Macon to see the progress that's going on and to learn about community development programs. We love this quote from Monday night's presentation, "It's Happening Here: Eleven Signs a City Will Succeed!" FCHM is proud to be a part of this city and community - alongside people like YOU! Special thanks to Historic Macon Foundation, special guest James Fallows from The Atlantic, and, of course, Macon's own Alex Morrison for these inspiring words. FCHM is in the process of applying to acquire properties through the Macon-Bibb Land Bank. We are hopeful to acquire another in Napier Heights as soon as early May, just in time for summer volunteering! If you know of any properties that FCHM could acquire or have donated, especially a house with four or more bedrooms, please let us know! We're kicking off a new spring-inspired campaign next month! With the help of our volunteers, we have converted small birdhouses into collection jars for loose change. Small gifts of loose coins add up to big changes for those living in poverty housing. If you are interested in displaying a birdhouse collection jar at your business or workplace, please contact the office to make arrangements! Stay tuned for more information! Spring break is right around the corner, March 3-10! This year FCHM will host two groups from James Madison University from Harrisonburg, VA and Wittenberg University from Springfield, Ohio. We love working with college groups during this "alternative" spring break! Mark your calendar for Saturday, March 10 from 10am-12pm! Mary Pinson, a well-known floral designer in Middle Georgia, will host a workshop in her studio to benefit FCHM! Design, create, and take home your own floral arrangement alongside Mary and other design enthusiasts. The workshop fee includes the cost for materials and supplies. Find more details on our Facebook, and reserve your space here! Read more from the February Newsletter here. Blight Committee Meeting The next blight committee meeting will be on February 16, at 11:30 a.m., at Macon Area Habitat for Humanity. This is a great space to meet and address the concerns about blight in our community; we hope to see you there! The FCHM appreciates all the groups who help us keep our cost at a minimum by donating monthly materials and supplies used regularly. Donations of this type help Fuller Center Macon stretch every cent gifted to the organization. See a full year's schedule of supplies and materials we use regularly at www.fullercentermacon.org. Any group can participate, whether a school, church, civic club, book study group or your bridge team. Products we're collecting in February are paper products. We use tissues, toilet paper, plates, napkins, paper towels, and cups when volunteers work all day at the work site. We use zip lock bags to store nails and screws. March and April Supply Drive will be for Safety Products used on the construction work site and include safety glasses, work gloves, plastic gloves and dust masks. 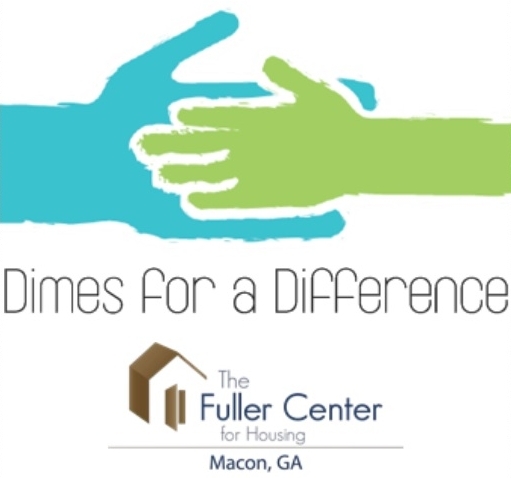 Thank you for adopting The Fuller Center Macon and helping us to keep our costs low! Join us on Saturday, February 10, for the first Napier Heights Community Meeting! This is designed to be a space to get to know the Napier Heights neighborhood, express ideas or concerns, and establish a long-term community group. The meeting will be at 11am at Outreach Mission Church of God, 2140 Montpelier Avenue. One Week Until St. Peter's Group! Volunteers with St. Peter's from Elmhurst, Illinois, will be working with FCHM from February 17-24 in the Napier Heights neighborhood! This is St. Peter's third year volunteering with FCHM and we love spending time with this group of hardworking, loving individuals! There will be a potluck dinner Sunday, February 18, at 6:30 p.m. at Camp Echeconnee to welcome the group. All are invited to attend! Bring a covered dish. What a night! The Second Annual FCHM Benefit Concert with Maggie Renfroe and Reid Houghton on Saturday, January 27 was a huge success! Maggie and Reid performed some incredible music for a full house and the crowd loved it! With your help, we raised a total of $12,267 and over $1,800 in raffle ticket funds alone. The winner of the 50/50 raffle, a member of the Renfroe family, generously donated his prize back to the Fuller Center Macon. Thank you to all who organized, attended, donated, and sponsored this event! If you couldn't make it to the concert, check out this video instead! Thank you to our sponsors: Cherokee Brick, GEICO, James-Bates-Brannan-Groover, LLP, McNair, McLemore, Middlebrooks & CO, Fazoli's Italian, Widner & Associates, & Greg's Georgia Gardens. On January 24, 2018, the Moxie Matters Tour came to Macon, Georgia! The event is co-hosted by Jen Hatmaker and Nichole Nordeman and was "a night of lively conversation and soulful music on wrangling delight out of the mess of life." The event emphasized empowering women and featured FCHM's Executive Director, Dianne Fuller! The interview portion of the event with Dianne was both inspiring and as conversational as talking with a friend. It was great to spread FCHM's name while connecting with the community during this fun-filled evening! It's January and school is back in session! Mercer University students Jordan Moore and Erica Duncan are excited to work with the Fuller Center for Housing of Macon during this academic year! Their positions began in August and will continue through early May. Jordan is a junior majoring in Religion. This is her second year with the work-study partnership, interviewing families and assisting with the application process. Erica is a sophomore double-major in Sociology and Spanish. She is the first intern through Mercer's Community Development and Engagement Program and is focusing on Napier Heights revitalization. We're so glad to have them with us! The Fuller Center for Housing Macon is working to revitalize the Napier Heights neighborhood. Check out what's going on over the past few months! 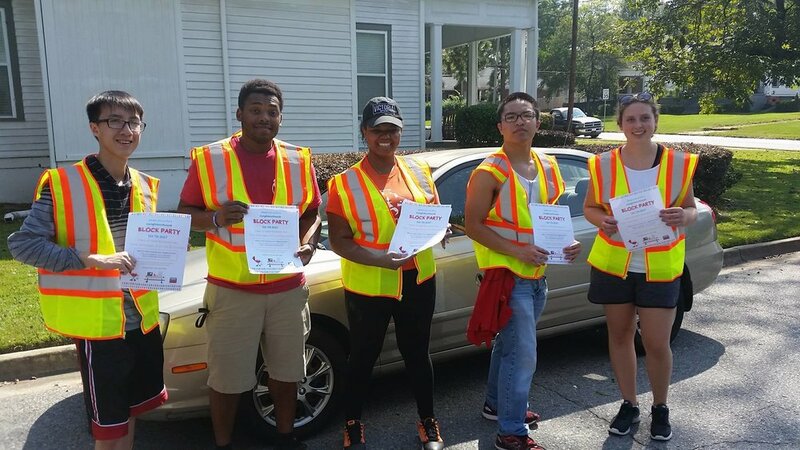 Getting to Know the Neighborhood Have you seen our volunteers and staff out canvassing the streets of Napier Heights? As we hand out flyers for our upcoming block party, we've also stopped to talk with residents and families. It's been great to get to know the people of Napier Heights! Derelict House Torn Down The property at 1231 Holt Avenue, donated to FCHM in 2016, has been demolished! This blighted structure had become unsafe and was an eyesore for the neighborhood. Thank you to Southern Equipment Company and Jeff Surles for their help. Community Garden Morgan Wright, a Macon resident, has received the Emerging City Champion/880 Cities Grant sponsored by the Knight Foundation to install a community garden in the Napier Heights neighborhood. Community gardens are a great way to "grow" neighborhood pride and educate about healthy, sustainable food choices. More updates will be available soon! Looking for 4-Bedroom Home We are currently looking for a 4-bedroom home in the Napier Heights neighborhood. If anyone knows of a property that FCHM could acquire or have donated, please contact the office at 478-845-8087. In the Works We have a lot of projects in the preliminary stages, including the establishment of a mini-park, improving crosswalks, getting ownership of derelict houses, and forming a neighborhood association. As always, we welcome and invite community input! #MyGivingStory Contest Update Congratulations! Erica Duncan, who is the Community Development & Marketing Intern at FCHM this academic year, was named a winner for the Spanish division of the #MyGivingStory contest from Giving Tuesday! The prize is a grant of $1,500 to the entrant's preferred non-profit - in this case, FCHM! Thank you to everyone who entered their #MyGivingStory, read, and voted! You can read Erica's story here, and translated to English here. Read the rest of our January Newsletter here.